Watching an elderly loved one struggle with a disability is never easy. But while most of us simply grimace and soldier on, U of T Engineering alumnus Mark Elias (CivE 1T4) decided to do something about it. 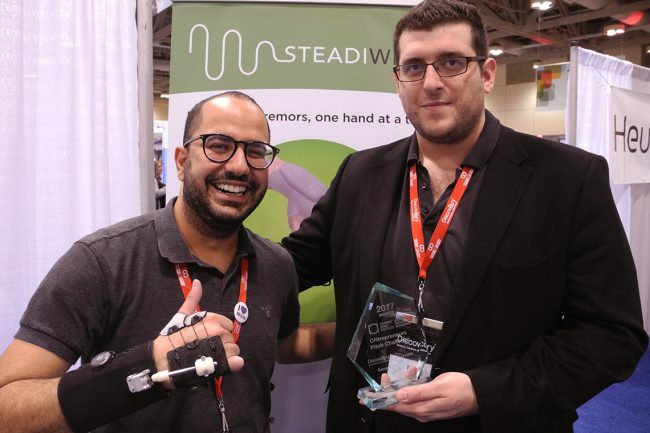 The co-founder of Steadiwear, a University of Toronto startup, developed a specially designed glove that stabilizes the hands of patients with Parkinson’s disease or essential tremor. 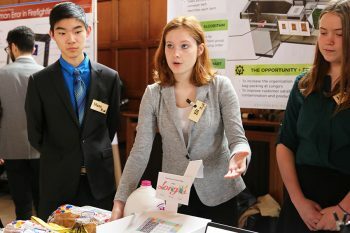 This week, Steadiwear was one of two U of T startups to win competitions at the Ontario Centres of Excellence Discovery conference, an event that seeks to promote the commercialization of innovative ideas in the province. The other startup was MyndTec Systems, which won an accessibility-tech pitch competition with an electrical stimulation system that helps patients with upper-limb paralysis regain movement. Elias got the idea for Steadiwear after visiting his grandmother in France several years ago. His solution? Elias started by investigating the tuned dampening systems used to make buildings more earthquake resistant. He eventually settled on a ball joint surrounded by a non-Newtonian fluid – not unlike the state-shifting slurry one gets by mixing cornstarch with water. 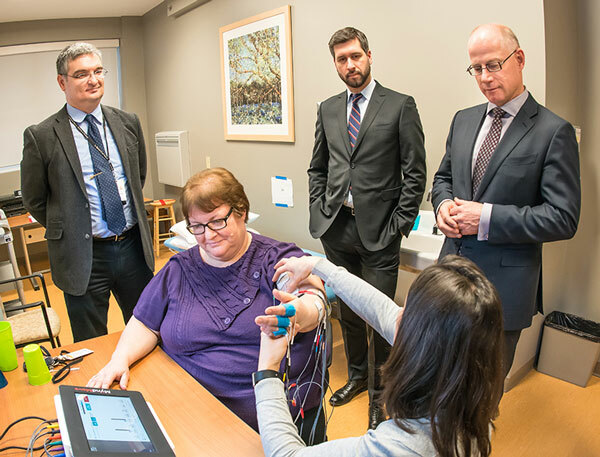 The resulting device, developed with co-founder Emile Maamary at U of T’s Impact Centre accelerator, allows patients to move their hands voluntarily but stiffens up when it encounters the quick, jerky movements associated with tremors. On Tuesday, Elias and Maamary won the Ontario Brain Institute’s ONtrepreneurs $20,000 Pitch Challenge – the fourth award Steadiwear has won in the past few months. U of T startups, many of them focused on the accessibilty space, put in a particularly strong showing at the ONtrepreneurs pitch competition. 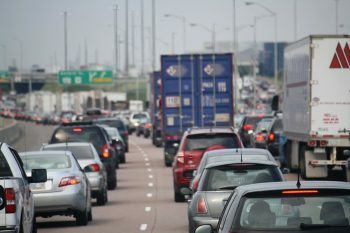 All but one of the five finalists were from the university, which boasts 10 accelerators spread across its three Toronto-area campuses. 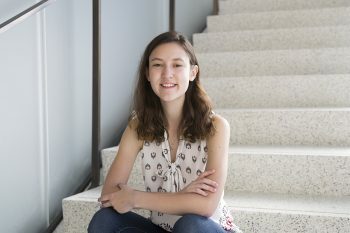 The others were: WinterLight Labs, which developed a system to assess dementia based on patients’ speech; iMerciv, which makes a wearable device to assist people with vision loss; and SensOR Medical Laboratories, which devised a force-sensing skin tool to help students and surgical residents improve performance when using minimally invasive surgical techniques. The other big U of T winner at OCE Discovery was MyndTec, co-founded by Professor Milos Popovic (IBBME and Toronto Rehab), and Professor Aleksandar Prodic (ECE). MyndTec’s first commercial product, MyndMove, uses a system of coordinated electrodes to stimulate arm muscles and replicate functional upper limb movement in patients who have suffered strokes or spinal cord injuries. Here’s how it works in practice: a physiotherapist will tell a patient to think about executing a movement – making a fist, for example – and MyndTec’s system will stimulate the patient’s arm into action. MyndTec’s equipment is already available at clinics in Ontario and B.C.. The company is now preparing to launch into the huge U.S. market. Reza Moridi, Ontario’s minister of research, innovation and science, congratulated MyndTec and the accessibility competition’s other finalists, which included TranQool – a startup founded by U of T alumni that uses encrypted video to match users with cognitive behavioural therapists. “These talented innovators are making a real difference for people with disabilities, and for Ontario,” Moridi said.